While the history of the Third Reich and its Führer Adolf Hitler has been discussed at length for the past eighty-odd years, the period provided what could only be a gift for philatelists from around the world. During the ill-fated twelve years of the “thousand-year Reich”, there were a number of innovative and beautiful stamp designs, including a number of commemorative issues. It is often said – often in jest though the facts do actually speak for themselves – that the Nazis made the best uniforms; it is however something of a lesser-known fact that they were also probably responsible for some of the most memorable and beautiful stamps as well. In examining German stamps from this period, one can clear get the impression that they were printed not just for regular postal use for also for philatelists; indeed in 1942 a commemorative stamp was issued that even featured a man, magnifying glass in hand, looking at his stamp album. While in Great Britain collectors were left with the mundane “King’s head” definitives and the occasional high-value issue commemorating some royal birthday, wedding or anniversary, stamp enthusiasts in Germany were presented with a plethora of designs that celebrated not only Adolf Hitler and the Nazi party but also composers, writers, artists, scientists, automobiles, locomotives and the military. The period also saw the rise of the minature sheet, issued for special events and often decorated with commemorative postmarks and cachets. It is interesting to note that while there were a small number of issues dedicated to National Socialist ideology the vast majority of the designs that were issued between 1933 and 1945 had little or nothing to do with politics, let alone bombastic propaganda – a marked contrast to many of the designs that came out of the Soviet Union and its satellite states after the war. Outside of the obligatory annual issue marking his birthday, the figure of Adolf Hitler was in the main confined to the banal definitive issues known as the “Hitler head” – while artists made hay with designs that probably feature as the oldest items in many thematic collections today. Having been interested in and a collector of pre-war German stamps for over twenty years, I had always been acutely aware that there was next to nothing readily available that provided more than just cataloguing data. Like most British-based collectors, I started out with the somewhat rudimentary Stanley Gibbons Germany catalogue – perhaps not the best investment – before moving onto the world of the Michel specialist volumes. Of course, knowing a little deutsch helped, but even then there was little to be seen beyond the raw technical data – fascinating though it is. 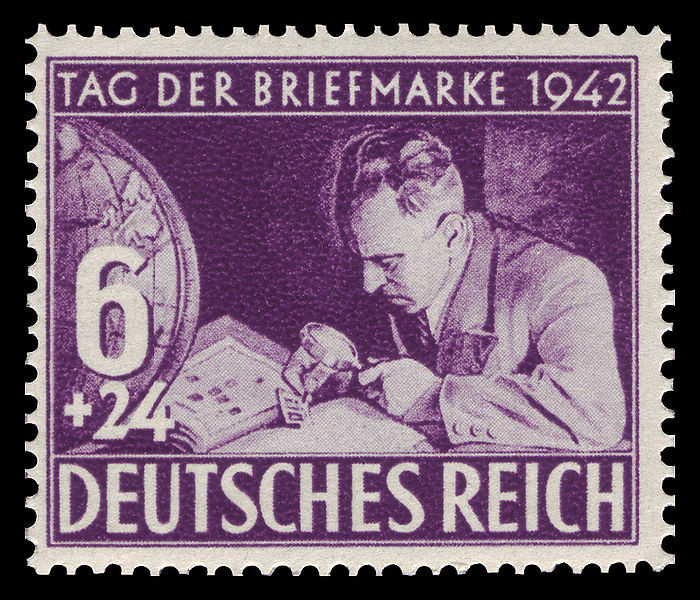 Unlike the stamps issued in many other European countries during the same period, German stamps – particularly those issued during the Third Reich era – are not only interesting from the philatelist’s perspective but also from that of the historian and biographer. As both a philatelist and historian, I saw a wonderful opportunity to try and put together a more readable overview in the English language, something that would provide details not only on the stamps themselves but also offer a little historical background and context – in short, prising open that little historical window that many of these fascinating pieces of paper provide. To many people, stamp collecting has become less of an interesting and rewarding hobby and more of an investment opportunity; while I am loathe to criticise – my own collection after all is ultimately an investment – we have moved away from the pure faith. I became interested in stamps when I was young not because I felt I could make money out of them; I found them interesting because they offered an insight into a particular country, enhanced my knowledge of geography, world events and personalities. As a child my stamp collection often led me in a number of different directions, and it is somewhat sad to see that young children today have little interest in something that often kept me busy, fascinated and intrigued – often for hours on end. While every one of the stamps issued during this twelve year period will be covered, the aim of this site is not to provide detailed and specific technical coverage; for more detailed information on shade variations, printing errors and postmarks I would recommend a copy of volume one of the latest Michel specialist catalogue. Of course, if you are a collector of German stamps I’d expect that you have a copy already; I’d like to think that the information, trivia and stories contained in this site – or any book that may come about as a result – would complement Michel rather than take anything away from it. My aim is for this site to be a source of reference not only for philatelic enthusiasts and collectors of German stamps, but also those who may be students of what was an incredibly interesting historical period. After all, stamps are more than just a method of paying for postage; they are themselves little snapshots of history. I would also hope that this website is somehow able to kindle – and in some cases rekindle – a similar interest in others. § This site is a philatelic and historical resource, and is not intended to glorify any particular political ideology or regime. If certain symbols may offend, please hit your back button. Design Enhancements and Content © Rick D. Joshua 2011.